Will kooky Emmy voters nominate Donald Trump for hosting 'Celebrity Apprentice'? "MACBETH for AMERICANS" is a good by-line for this production...and that is praise. 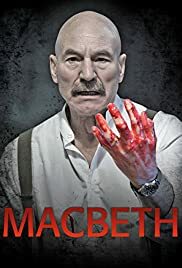 Featuring an entirely USA casting (look for a lean and hungry--and bearded--Kelsey Granmer as Ross) and a elaborate yet simple stage plan, MACBETH becomes accessible to those easily intimidated by the "British style" that dominates Bard productions. Philip Anglim's finest hour.